I’ve been more than a little excited for Better Call Saul, the new television series from AMC. I’m not the only one whose been excited for this program, but the shoes that this show is filling are pretty damn large. Saul is a spinoff of Breaking Bad, which is not only one of the great television programs of all time, but one of the best pieces of storytelling ever assembled for any medium. It was a thrilling, heartbreaking, and very darkly funny television series. How the hell are you gonna top that? Well, Bad creator Vince Gilligan and Bad writer Peter Gould aren’t trying to do such with this program, which both of them created this spinoff together. 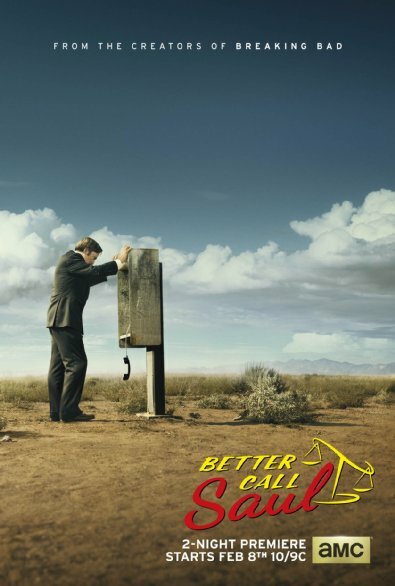 The show is still set in the lovely desert of Albuquerque, New Mexico (a land that I will be soon very familiar with, more to come on that…), and features our favorite shady lawyer Saul Goodman, who in this prequel is actually Jimmy McGill, a struggling lawyer in the Land of Enchantment that hasn’t quite discovered his need to be the shady strip-mall lawyer that we all know and love. This show is setting out to tell how Jimmy became Saul. Here are my reviews on the first two episodes of Better Call Saul, and yes, there are SPOILERS. Be advised. The program begins exactly the way I wanted and predicted the show to open, and I’m very happy that Gilligan and Gould read my mind on that one. We see Saul working at a Cinnabon in Omaha, Nebraska. I really loved this opening because it’s not really funny or witty, in fact its pretty damn sad. Shot in black and white with an old jazz standard playing as Saul manages this Cinnabon, looking over his shoulder at being killed at any moment after the events that unfolded in Breaking Bad. Saul is balding, with a mustache and some very creepy looking glasses. After shutting down shop for the day, we see Saul living in a small apartment by himself in the middle of winter. He finds a box inside his apartment with a video tape in the box. Saul pops it in and we hear the audio of an old advertisement of Saul’s commercials. Saul begins to tear up at the sight of his former life, and that’s when Better Call Saul begins. Saul is Jimmy McGill, who lives in Albuquerque with his brother, played wonderfully by Michael McKean, who has a mysterious illness and is a recluse. Jimmy’s brother is a partner at a large firm in the city, and Jimmy is trying to buy him out, but his brother is certain that he can bounce from this illness. Saul doesn’t have much, other than his practice which is in the steaming room of a nail salon. After trying to pull a scam on a couple that he’s trying to get as a client, which goes horribly wrong, he runs into the wrong man in Tuco Salamaca, the same character that Walter White and Jesse Pinkman will encounter in a few years, once again played by Raymond Cruz, which is the end of episode one. In episode two, Jimmy and the two local scammers are brought out to the desert, and Tuco is about to kill the two scammers before Jimmy is able to negotiate their lives by Tuco only breaking their legs. Jimmy continues to struggle his way into being a respected lawyer until the very end of the episode, when one of Tuco’s men walks into his office and offers to help in scamming this couple. Jimmy is reluctant to say so, and that’s where we end the first two episodes of Better Call Saul. The first episode was directed by Vince Gilligan, with the second being directed by another Bad director, Michelle MacLaren, who will be directing the Wonder Woman film for Warner Bros. in a couple of years. Judging from the first two episodes of Saul, don’t compare it to Breaking Bad. It isn’t even in the same ballpark as Breaking Bad in terms of quality (granted, it’s been two episodes so far). But Better Call Saul, judging from the first two episodes, has lots and lots of potential. I was thoroughly entertained by the first two episodes of Saul, and I will most definitely continue to watch the program every Monday nights from here on out. Obviously, it doesn’t hurt that Bob Odenkirk, one of the great comedians of our time who in the past couple of years has turned into a great character actor, is fantastic in reprising his role of Saul, or Jimmy. I can’t say that Jimmy McGill is by any means a good person. With the first couple scenes in the first two episodes of Saul, you can see Jimmy channel the Saul that we’re familiar with in Bad, but it isn’t quite as dirty or immoral as we’re use to…yet. Michael McKean is also very good as Jimmy’s brother, and it will be interesting to see what exactly is wrong with his character, and whatever outcome will come of it affect Jimmy and allow him to turn into Saul Goodman. The program, similar to Bad, is a character study, and that’s one of the best things that Saul has working for itself. It’s just fascinating watching the beginning of Jimmy’s transformation, which if Saul is as big of a hit as Bad was for those last couple of years, could make for some really fascinating television. I really like that the show has a similar visual and story structure to Bad, with a lot of cool camera angles and some really gorgeous cinematography of Albuquerque and northern New Mexico as a whole. However, I do have a couple of complaints with the first couple of episodes, but they are minor. As you may know, Jonathan Banks reprises his role of Mike in the series, and in the first two episodes he’s just a parking attendant in a booth, with his sequences being some of the funniest in the first two episodes. Granted, since Banks is a series regular, we will probably begin to see more of him in future episodes, but I would’ve liked for just a little more with Mike early on. Also, the first episode was indeed entertaining, but dragged just a little bit. The second episode was a lot more exciting and high-octane, with that sequence in the desert of Jimmy negotiating with Tuco being extremely effective. But these are just minor complaints, and this is television, not the movies. The great thing about television (and why its begun to eclipse the movies in several respects) is that there is more time for the characters to grow and develop, thus you have more of an attachment with these folks than with most characters in a two-hour film (not all films, but you get the gist of what I’m saying). I’m very impressed with what I see so far of Better Call Saul. The series has the potential to not only be a great spin-off of a great television series, but if it continues to get stronger and stronger each week, Saul could be able to stand on its own as being a very entertaining and well written, acted, and directed hour-long drama each week. I trust that Gilligan and Gould know what they’re doing with this program, and hopefully they’re going in the right step (Frasier) instead of the wrong step (AfterMASH). If you haven’t watched the first two episodes (first, sorry for spoiling it, and also, didn’t you see SPOILER bolded a couple of paragraphs ago? ), I highly recommend that you do so, especially if you’re as big of a Breaking Bad fan as I am. And a good thing about this program is by the time the seasons wrapped up, the final episodes of Mad Men will begin to air. Hopefully Matthew Weiner doesn’t end it with Don Draper and co. in a diner.